Madge advises Gemma to quit her job at the dress shop, but Gemma refuses. Helen comes out to find Dorothy heading off to the museum with a historic bone, thought to be a tool used by witchdoctors in Africa. 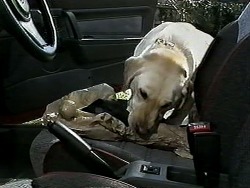 As Dorothy pops inside to pick up her diary, Bouncer comes by and spotting the bone sitting in the open car, picks it up and runs off. As Gemma comes through to the kitchen, Madge continues to persuade her to quit her job. Gemma refuses and heads out without any breakfast. Harold admits that Madge is being rather harsh towards her, but it would probably be a good idea for her to quit, as she is spending a lot of time re-sewing the labels into the dresses. 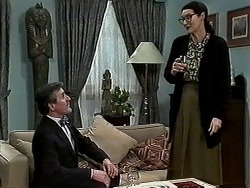 Madge realises that Felicity Brent is cheating with her business and thanks Harold. Dorothy returns to find the bone has gone. She asks Doug if he's seen it, as Bouncer comes back into the street with a muddy face. Doug suggests that Bouncer may have taken it; it's only natural! Dorothy isn't impressed. 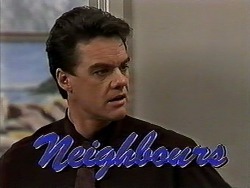 Paul and Caroline are having a shouting match over some business decision as Christina and Melanie wait patiently outside. Helen arrives and soon hears the barney. Paul follows Caroline out into the reception to grab a file, continuing their argument and completely ignoring the other three. The argument soon heads back into the office. 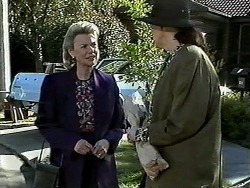 Madge arrives and goes to talk to Gemma; she explains that she was to hasty and seeing how much she enjoys the job, gives her blessing to allow her to continue working there. Out of curiosity, Madge asks when her next shift is; that evening; and mentions she might pop by to find a dress for herself. 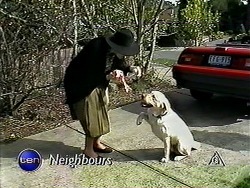 Dorothy is offering Bouncer an old broken bone, trying to persuade the dog to show her where her precious bone is. 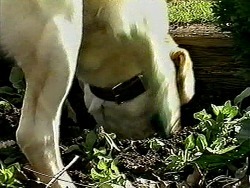 Bouncer runs off and starts digging, but finds an old boot, at the second spot he finds a small animal bone. Dorothy continues to follow him to a third and a fourth site, but with no avail to Dorothy's bone. As Dorothy searches through all the random bone bits that Bouncer found. 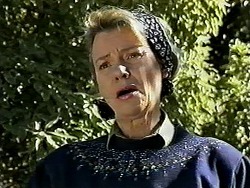 Madge comes storming over, determined to find out why all her seedlings have been dug up. Dorothy explains about the bone, and Madge clearly isn't impressed. Melanie hands Paul and Caroline their messages as they return from the meeting. Caroline is pleased how the meeting went, but Paul is still in a foul mood and not so impressed. He explains how he thought Caroline used her sexuality in the meeting, and how all women do it. Caroline points out that she didn't and that surely says something about what Paul is thinking. Paul heads into the office in a mood. Gemma is picking out more dresses to try and Madge is in the changing room. As Madge is taking so long, Gemma goes in to, and soon realises that Madge is busy picking the label off the dress. Madge points out that the dress is actually from Taiwan, and that Felicity is ripping off her customers. Felicity comes in and wonders what is going on. Madge agrees to buy the dress. Helen is busy putting her flower bed back to how it should be as Dorothy comes over. Dorothy explains what has happened, and how she's had to take the day off work to find it. She's disappointed that she no longer has anything to give to the museum. As Bouncer returns with yet another wrong bone, Helen advises her not to give up yet. Dorothy is busy examining the bones again when a gentleman from the museum arrives. Dorothy apologises for it going missing, and witters on for a while, before admitting that it was taken by a dog. The man looks surprised. Melanie brings some papers through for Paul to sign. While he's signing them she tries to get across the message that she has no more work to do, and could she possible leave early. When he cottons on and tells her just to ask for time off, she does, but he says no. Caroline looks on confused. 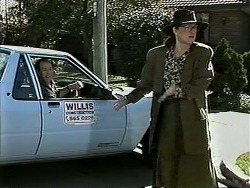 With the shop quiet, Gemma takes the chance to call Madge. She explains, after talking to the manager of the shop, that Mrs Brent has an agreement with the manufacturer in Taiwan to sew her own labels onto the dresses, and that it's legal. Madge is disappointed and tells Gemma to hand in her notice again. Gemma refuses and hangs up the phone. 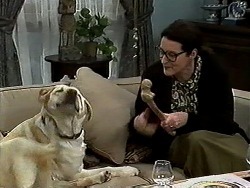 As Dorothy is drowning her sorrows with a glass of scotch, Bouncer turns up with the bone. Dorothy is relieved. Paul is still in a foul mood and shouts at Melanie for incorrectly typing up his dictation of a letter. Christina arrives and is annoyed to have found out that one of the staff members was fired because she didn't turn up for work that morning. The three ladies aren't impressed, and Caroline announces that if Paul doesn't re-instate her immediately, she will quit. Paul argues that women always team together and it results in all three women quitting their jobs. They tells Paul to stop taking his personal issues out on them.